January 31 from 8 a.m. - 4 p.m.
February 1 from 8 a.m. - 3 p.m. 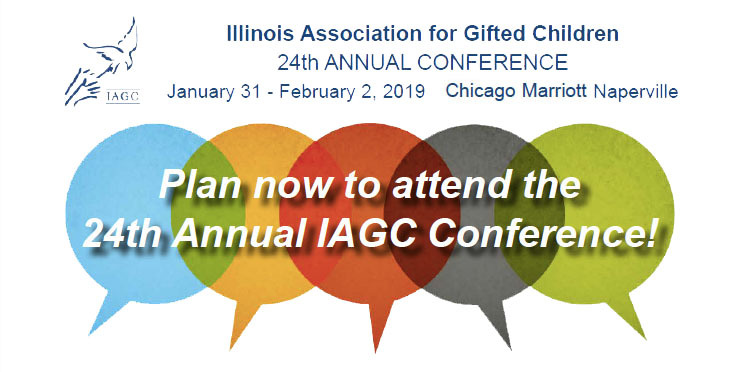 In addition to learning from amazing professionals in the field of gifted education and hearing some of the best speakers in the business and networking with others regarding gifted children and their needs, one of the great benefits of attending the IAGC Convention is the exhibitor's showcase! Be sure to set aside some time to peruse the exhibitions and perhaps pick up a new book or learn about a new program! Most of the above exhibitors, though not all, will be in the Hobson and Bailey rooms on Saturday for the benefit of our Parent Saturday attendees. The following exhibitors will only be onsite on Saturday.